Comprehensive review of Ulta Tinted Self Tanning Gel. See what real experts and actual users have to say about this self tanning product. This is another one of those products that’s just average in our opinion. For starters, the gel has a dark guide that could potentially be messy, but the consistency is very thick so at least it doesn’t drip and splatter all over. The feel of this product was really nice, it was smooth and not too sticky, it blended nicely into my skin. The smell resembles kitchen cleaner with a tiny hint of DHA; I was not a fan of the smell at all. The final color produced was lighter than I had hoped. I ended up with a light, medium tan. The tan only lasted about 2 days before it faded away, which wasn’t great. You can’t beat the price of this product, it was only $4.49! But overall, the inexpensive price doesn’t justify the mediocre results. The Ulta Tinted Self Tanning Gel comes out as a dark gel that’s very slick. The gel is pretty thick and it has a shimmery look to it. Application of the product is pretty easy, you just have to be careful because there’s a dark guide. The product is very smooth and slick so it blended into my skin very nicely. I would suggest using a tanning mitt when applying this product so it doesn’t stain your palms. The gel is pretty thick, which I liked because it didn’t drip or run anywhere. This product dried in about 20-25 minutes, so it took a little less than the average self tanner. The product goes on very wet like most gels do, and slowly dries in about 25 minutes tops. Make sure you wait to put your clothes on or crawl into bed as the guide can stain fabrics before it dries. Unfortunately, Ulta Tinted Self Tanning Gel smells like kitchen cleaner. After I put it on I kept thinking my house had just been recently cleaned because the strong scent followed me everywhere! I could faintly smell the DHA in the product, but the “cleaner” smell definitely was stronger. Several hours after application, I still smelled like a freshly cleaned kitchen, and the smell lingered into the next day. Thankfully, after I washed the product off the smell disappeared as well. When I woke up the next morning I had a nice medium, dark bronze tan. However, once I washed the product off, my tan faded as well and I was left with just a light medium tan. The guide was obviously what gave me the most color, and the DHA played only a small role in darkening my skin. The shade I used was “Medium Deep” so I was hoping to get darker with this tanner, but I only got a few shades darker. Overall, the color was pretty smooth but it was a little splotchy/darker around my ankles. Ulta Tinted Self Tanning Gel lasted only around 2 days. After day 2 I noticed I looked a lot “whiter” and my tan had drastically faded. I wish this product lasted a little longer, as 2 days is less than most self tanners out there. I don’t think men will like this product. It has a dark brown guide, which could potentially become a huge mess during application. You can get Ulta Tinted Self Tanning Gel for only $4.49 for a 5 oz bottle. That works out to about $.90 an ounce, it doesn’t get much cheaper than that! Unfortunately, in this case you sort of get what you paid for. 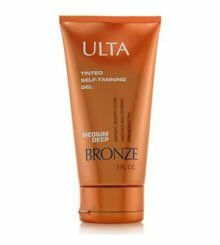 To buy Ulta Tinted Self Tanning Gel, Click Here. Look and Feel This is a gel with a dark brown guide. Application Application can get messy with the guide, but the thick consistency of the product helps a bit. Drying Time It took about 20-25 minutes to completely dry. Smell (After) The smell stuck around until I showered the product off, then it faded away. Color Produced The color ended up being a light, medium tan. I wish it would’ve been darker. How Long It Lasts This tanner only lasted about 2 days. OK For Men? No, the guide is too messy and the color is too light. Plus it doesn’t last very long. Price This gel was $4.49 for a 5 ounce bottle….one of the cheapest we’ve seen!